Pig Latin Translator just what you need when you're speaking the language. Enter your word press the button and your word is instantly translated into the Pig Latin language. 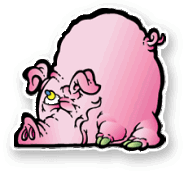 Use our Free Pig Latin translater whenever to find yourself speaking to a Latin Pig! Enjoy our Pig Latin Translator in The PCman's fun, free games arcade.